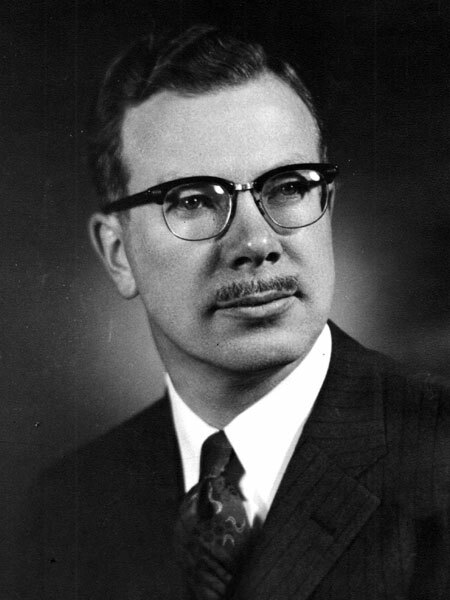 Automobile dealer, MLA (1950-1953), MLA (1954-1957), MLA (1958-1959), Premier of Manitoba (1958-67), MLA (1959-1962), MLA (1963-1966), MLA (1966-1967), Senator. Born at Winnipeg on 17 June 1917, son of Charles Dufferin Roblin (1892-1973) and Sophia May Murdock (1891-1974), grandson of Rodmond Palen Roblin, he was educated at Kelvin High School, St. John’s College School, University of Manitoba, and University of Chicago. During the Second World War, he served as a Wing Commander in the Royal Canadian Air Force. He was first elected to the Manitoba Legislature at the 1949 general election, and was re-elected in 1953, 1958, 1959, 1962, and 1966, serving as Premier of Manitoba from 1958 to 1967. During his tenure, the Red River Floodway around Winnipeg, known affectionately as “Duff’s Ditch,” was constructed. He resigned from provincial politics in 1967 to seek the leadership of the federal Progressive Conservative party but placed second to Nova Scotia premier Robert Stanfield. In the 1968 federal general election, he ran as a candidate in the Winnipeg South Centre constituency but was defeated by Liberal E. B. Osler. On 30 August 1958, he married Mary Mackay (1929-2015) at Winnipeg and they had two children. He was a long-time member of the Winnipeg Squash Racquet Club. In recognition of his exemplary community service, he was awarded honorary doctorates by the University of Manitoba (1967) and the University of Winnipeg (1968), he received a Centennial Medal of Honour from the Manitoba Historical Society (1970) and a Queen Elizabeth II Silver Jubilee Medal (1977), he was made an Honorary Member of the Winnipeg Press Club, and he was inducted into the Order of Manitoba (2000). He died at Winnipeg on 30 May 2010 and was buried in the Elmwood Cemetery. He is commemorated by Duff Roblin Provincial Park and the Duff Roblin Building at the Fort Garry campus of the University of Manitoba. “Duff Roblin, 1958-1967 ” by William F. W. Neville in Manitoba Premiers of the 19th and 20th Centuries, edited by Barry Ferguson and Robert Wardhaugh, Canadian Plains Research Centre, 2010. “Their own homes for 1958,” Winnipeg Free Press, 27 December 1958, page 5. The Ancestry of the Hon. Duff Roblin, Premier of Manitoba, Miscellanea Manitobiana. Obituary, Winnipeg Free Press, 2 June 2010, page 30. Obituary [Mary Roblin], Winnipeg Free Press, 16 December 2015. We thank John Perrin for providing additional information used here.